Barrick Gold is the second largest publicly-traded gold producer, with an equity market capitalization of $11.6 billion. Like its rival, Newmont Mining, Barrick is focused on reducing costs and improving operating efficiency to maximize free cash flow generation in this rangebound gold price environment. The company has also reduced debt by $7.3 billion or 55.7% since the end of 2014. Unlike Newmont, however, Barrick’s financial and operating performance has been more volatile in recent years, which has caused the market to put a greater discount on its share price. 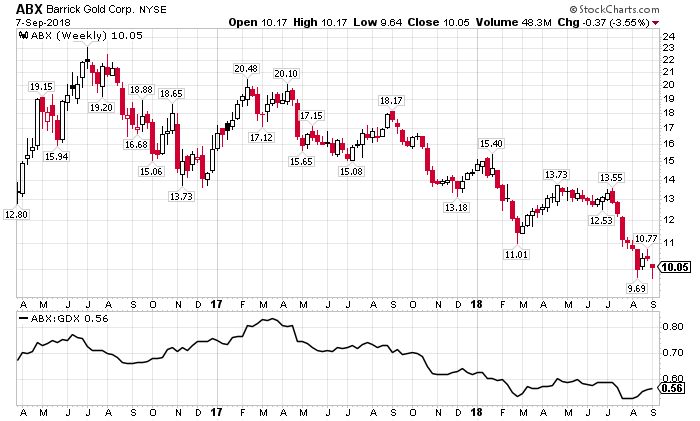 From the end of 2011 to August 31, 2018, Barrick Gold’s share price has fallen 78.3%, worse than the 68.1% decline in the Van Eck Vectors Gold Mining ETF (GDX). The decline in ABX’s share price was due primarily to the impact of the decline in gold prices on the company’s financial performance as well as operational challenges at certain mines. Barrick recorded $27.2 billion of impairment charges against long-lived assets, goodwill and intangible assets from 2012 to 2015. To put this in perspective, the total book value of its property, plant & equipment, goodwill and intangible assets was $39.3 billion at the end of 2011. Under international financial reporting standards, companies are permitted to reverse impairments if the fair values of the assets increase. In 2016 and 2017, Barrick recovered about $400 million of its previous impairment charges. While the 2012-2015 impairment charges were taken across many of Barrick’s mines, about 40% of the these charges related to two mines:- $5.0 billion for the Lumwana copper mine in Zambia (Africa) and $6.0 billion for the Pascua Lama gold mine which straddles the border between Chile and Argentina. The Lumwana impairment was driven by a reassessment of the reserves and future production from the mine (which may now be in the process of being reversed). The Pascua Lama impairment was driven by regulatory challenges that caused Barrick to cancel its development plans for the mine. Although Barrick’s free cash flow (defined as cash flow from operating activities minus capital expenditures) was modestly negative in 2012 and 2013, the years when impairment charges were highest, the company generated positive free cash flow from 2015 to 2017. The impairments helped pave the way for divestitures and asset sales, which totaled $4.9 billion from 2012 to 2017, equivalent to two-thirds of the company’s total debt reduction. With the divestitures, Barrick has become more focused over the past five years, but the impairment charges and resulting net losses and negative EPS recorded from 2012 to 2015 caused some investors and analysts to question the capabilities of senior management. By comparison, Newmont, which had to cope with the same decline in gold prices and which also was approached by Barrick in 2014 in a merger proposal, recorded only $136 million of impairment charges from 2012 to 2017. Critics have often bemoaned senior management’s lack of gold mining operating experience, which has been a key feature of the company since Peter Munk, who was previously a real estate executive, founded Barrick in the early 1980s. Executive Chairman John Thornton, a former president of Goldman Sachs, is also a professor at Tsingua University in Beijing and chairs two investment firms. Kelvin Dushnisky, who left his position as Barrick’s President at the end of August to become CEO at Anglogold Ashanti, is a lawyer by training who headed Regulatory Affairs at Barrick from 2002 until he was named co-President in 2014. Catherine Raw, Barrick’s CFO since March 2016 was a gold, mining and natural resources fund manager at Blackrock before she became Barrick’s EVP of Business Performance in May 2015. There has also been considerable turnover in the executive ranks. Barrick has had three Chief Financial Officers since 2012 and with the departure of Mr. Dushnisky in August is now seeking its third president since 2012. Focus on free cash flow and return on investment. When the price of gold collapsed from 2012 to 2014, Barrick pledged to abandon its traditional focus on producing gold ounces at any cost (with the expectation that the price of gold would rise forever) in favor of generating free cash flow and an acceptable return on invested capital. This change in approach can be seen in the cumulated $3.26 billion of free cash flow that the company generated from 2015 to 2017. Focus on Debt reduction. After completing the all-cash acquisition of Equinox minerals (in 2011), suffering cost overruns and a regulatory setback at Pascua Lama and being forced to renegotiate its lease on Pueblo Viejo with the Dominican Republic on less favorable terms, Barrick determined that it had too much debt, especially since there was little evidence that gold prices would soon rebound. Since the end of 2014 (through 18Q2), the company has reduced debt by $7.3 billion through a combination of free cash flow from operations and asset sales. Sales and closures of mines. Since 2012, Barrick has divested or closed 12 mining properties and sold part of its interests in five other properties (including two of its copper mines). These divestitures, asset sales and equity interest sales accounted for two-thirds of its debt reduction.Among the closures was Pascua Lama, a large gold project on the Argentine-Chilean border that was estimated in 2012 to have 17.8 million ounces of proven and probably gold mineral reserves. The Chilean courts refused to allow the project to proceed without completing its water management system as required by its environmental permit. With gold prices still falling, Barrick decided to suspend the project and record $6.0 billion of asset impairment charges. Although the project is not now counted in its reserves, Barrick continues to explore ways to bring the project into production. Streamlining the organization. Over the past five years, Barrick has pursued an operational restructuring through which the layers of management between its corporate headquarters and the operating mines have been eliminated, headquarters staff has been reduced by 40% and more operational decision-making has been delegated to the mines. As part of this transformation, Barrick has integrated in phases its Goldstrike and Cortez mines into one organization called Barrick Nevada. Barrick Nevada will serve as a center of technical excellence for the entire company. Strategic Partnerships. Barrick has also been pursuing strategic partnerships. In 2017, the company sold a 50% stake in its Veladero gold mine in Argentina to Shandong Gold Mining Co., Ltd (of China) for $960 million. The two companies also agreed to explore the joint development of Pascua Lama and another promising gold deposit in Chile. In July of this year, Barrick entered into an enhanced strategic cooperation agreement with Shandong under which the two companies would press ahead with studies to develop an underground mine at Lama, share technical expertise and best practices at one of Shandong’s mines and pursue joint investment opportunities on other properties that each company owns. Barrick sees the pursuit of a distinctive relationship with China through strategic partnerships as a priority.Besides the Shandong partnership, Barrick has joint ventures with Newmont Mining, Goldcorp, Premier Gold Mines, Novagold Resources, Zijin Mining, Antofagasta Minerals and Ma’aden. By my tally, the company has raised $2.7 billion since 2014 from the sale of equity stakes in its gold and copper mines. Focus on Innovation. Barrick is committed to the pursuit of innovation to enhance its future performance. This includes small and large scale projects to increase the productivity, operating efficiency and output of its mines.The company currently has initiatives in several areas, including enhanced ore body evaluation systems, autonomous mining, equipment electrification and improved extraction methods (that reduce waste removal). A coiled-tube rig prototype has the potential to reduce drilling costs. Its “Lab-at-Rig” prototype, which brings testing to the drill site, promises to reduce costs and improve drilling efficiency. In situ leaching may reduce water usage and environmental impact. Barrick has been testing methods of processing gold deposits that eliminate the use of cyanide. Barrick is also working with others to develop a gold-backed crypto currency.Barrick has a partnership with Cisco to drive the digital transformation of its business. This started at its Cortez mine in Nevada with the installation of advanced process and short-interval control systems in open pit, underground and processing operations. The Barrick Data Fabric is an enterprise-grade, big data analytics platform that will allow the company to identify variability and trends in day-to-day operations, generate real time data, predict failures and take quick action to respond to or avoid problems. Barrick is also expanding its use of automation in all phases of mining operations. Digital technology also has the potential to improve environmental performance monitoring. Acacia Mining. In 2017, the government of Tanzania placed a ban on exports of gold concentrate by Barrick’s 63.9%-owned subsidiary, Acacia Mining (ACA.L), and demand payment of back taxes of $190 billion. In November 2017, Barrick floated a proposal to the government, offering to create a new operating company to manage Acacia’s existing and future mines. Under this arrangement, Acacia would give the government the opportunity to participate in key operating decisions and would seek to maximize the economic benefit of Acacia’s activities for the country’s citizens and businesses (through increased employment, local procurement and more in-country concentrate processing, for example). Barrick has agreed to share 50% of the economic benefits of the new operating company with the government through a combination of royalties, taxes and a 16% free carried interest. It has also offered to pay $300 million to settle the back taxes owed issue. At about the same time as Barrick made its proposal, Acacia’s CEO and CFO resigned. Barrick executive Richard Williams, who may be a candidate for the position of President, has been dispatched to Tanzania to work exclusively on resolving this problem. In June, Barrick said that discussions with the government have been productive and that progress has been made on drafting definitive agreements. However, it would not impose a timetable on the discussions in order to allow the process to continue in an orderly manner. 2018 Second Quarter Results. While weakness in the price of gold has been the primary cause of the drop in ABX’s share price this year, the stock has still underperformed its peer group, down 30.3% compared with the 22.7% drop in GDX. The underperformance was probably driven by disappointing second quarter results as well as the announced departure of Mr. Dushnisky. Barrick reported a second quarter net loss of $76 million or $0.08 per share, compared with net income of $1.1 million or $0.93 per share in 2017. Excluding certain one-time items, like impairment charges, gains/losses on asset sales, restructuring costs and special tax charges, the company’s second quarter (non-GAAP) adjusted net income was $81 million or $0.07 per share, still down from $261 million or $0.22 per share last year. Total revenue fell 20.7% to $1.71 billion. Gold sales tumbled 22.0% to $1.56 billion due to a 25.8% drop in ounces sold (to 1.04 million), partially offset by 4.4% increase in the average realized price (to $1,306 per ounce). Copper sales declined from $125 million to $112 million, also on lower volume, partially offset by a higher average realized price. With the drop in volume, cost of sales applicable to gold production declined 8.7% to $1.06 billion; but on a per ounce basis, production costs increased 21.5% from $726 to $882. All other cost measures – cash costs, all-in costs and all-in sustaining costs likewise rose by more than 20% on a per ounce basis. The drop in profitability also affected Barrick’s cash flow. Its second quarter free cash flow was negative $172 million, which I believe was the company’s first negative free cash flow quarter since 2014. Management said that the results were in line with expectations. The declines in sales volume and earnings were caused mostly by planned maintenance activities at Barrick Nevada and Pueblo Viejo, which together account for more than half of Barrick’s gold production. In addition, Barrick’s Acacia Mining subsidiary has been forced to curtail part of its production because of a tax dispute with the government. The decline in gold production at these three mining complexes accounted for nearly 96% of the total 2018 second quarter decline. Besides those declines, Barrick reported that it did suffer unplanned maintenance downtime at its Lumwana copper mine in Africa. Although production improvement is expected at Lumwana for the balance of the year, management has reduced its 2018 full year copper production guidance from 385-450 million pounds to 345-410 million pounds and raised its cost per ounce estimates by about $0.25-$0.30 per pound. Even though second quarter results met management’s expectations, Wall Street was surprised and disappointed. Barrick’s 18Q2 adjusted EPS and revenues were meaningfully below the consensus estimates. In the trading session that followed the news release, Barrick’s stock gapped down at the open and closed down 6.1% on the day. The stock extended its losses during August, in line with the declines in the price of gold and investor sentiment on gold mining stocks. Despite the disappointing earnings, there were some positive developments at Barrick during the quarter. The company announced the discovery of a new, high grade gold ore deposit at Fourmile, which is located within the Cortez district, two kilometers north of the Goldrush project in Nevada. It advanced its pre-feasibility study of a pilot plant expansion at its Pueblo Viejo mine that could increase throughput by 50%. Barrick also made progress on the development of a third shaft at its Turquoise Ridge mine which is expected to double production to 500,000 ounces annually. All of these developments are expected to begin contributing to Barrick’s operational performance after 2022. Leverage. Barrick has reduced its outstanding debt from $13.1 billion at the end of 2014 to $5.8 billion, with the purchase of $621 million of its 4.4% Notes due 2021 subsequent to the end of the second quarter. Despite the reduction in debt, the company’s ratio of debt-to-total capitalization remains at just under 40%, due in large part to the large impairment charges taken from 2012 to 2015. Even so, the company still has an investment grade rating of Baa2. More importantly, Barrick has only about $600 million of debt coming due from 2019 to 2022, including the maturities of the $248 million of 4.95% Notes due 2020 issued by Barrick (PD) Australia Finance Pty. Ltd. and $337 million of 3.85% Notes due 2022 issued by Barrick Gold Corp. The 4.95% Notes recently traded at a 102.35 to yield 3.15%, which (assuming they were issued in U.S. dollars), was a spread of 55 basis points over Treasurys. The 3.85% Notes recently traded at 101.35 to yield 3.44% or 66 basis points over Treasurys. Both bonds are subject to make whole calls. Besides these two issues, Barrick faces no major debt maturities until 2032. Projected Performance. Despite the 18Q2 revenue and earnings miss, management reaffirmed its full year production and cost guidance for gold. (As noted above, it did reduce guidance for copper production and raised guidance for copper production costs.) The company expects to produce between 4.5 and 5.0 million ounces of gold at a cost of sales of $810-$850 per ounce, a cash cost of $545-$575 per ounce and an all-in sustaining cost (AISC) of $765-$815 per ounce. Management also said that it expected to produce 1.2 million ounces in the third quarter and that total ounces produced would be higher in the second half and gold production costs per ounce would be lower, due to more ounces produced from the lower cost Barrick Nevada and Pueblo Viejo mines. Assuming full year production and costs at the midpoint of management’s guidance ranges, I estimate that the company will generate GAAP earnings of $0.50 per share and (non-GAAP) adjusted earnings of $0.65 per share. My adjusted earnings projection is within the range of analyst estimates but above the average of $0.58, as published on Yahoo! Finance. If management’s third quarter gold production guidance of 1.2 million ounces is taken at face value, my estimate of 4.75 million gold ounces for the full year implies a 7% increase in fourth quarter production over prior year. Likewise, my cost of gold sales assumption for the second half assumes a 7.4% reduction in average costs compared with the 2018 first quarter. Both of these assumptions seem somewhat aggressive, but not unreasonably so, if production rebounds strongly at Barrick Nevada and Pueblo Viejo. My assumptions also translate into full year free cash flow (defined here as net income plus depreciation and amortization minus capital expenditures) of $446 million. (I use this definition for simplicity because I have not yet projected Barrick’s cash flow statement and balance sheet). Barrick generated free cash flow (defined as cash flow from operating activities minus capital expenditures) of only $9 million in the 2018 first half, down from $204 million in the first half of 2017. In the 2018 second half, it reported free cash flow of $429 million. The company’s long-term guidance (from 2019 to 2022 and at the midpoint of the ranges) translates into average earnings of about $0.50 per share and free cash flow (net income plus depreciation minus capex) of about $500 million annually. That guidance assumes that annual gold production levels range at or slightly below 4.5 million annually. The company’s capital expenditure guidance of between $1.1 billion and $1.5 billion annually implicitly incorporates both sustaining and growth initiatives. Valuation. Barrick’s estimates have come down in recent weeks, following the release of its second quarter results. At the current consensus estimates of $0.58 per share for 2018 and $0.66 for 2019 and Friday’s (9/7) closing price of $10.05, Barrick’s stock is trading at 17.3 times estimated 2018 earnings and 15.2 times projected 2019 earnings, both of which are below the peer group averages of 23 and 20 respectively. (The peer group consists of ABX, AEM. AU. AUY. BVN, EGO, GFI, GG, KGC and NEM). The discount, I believe, reflects concern over the company’s future performance in light of the disappointing second quarter performance. The company had been showing some improvement over the past couple of years, as measured by both GAAP and non-GAAP earnings, even though its free cash flow slipped in 2017. It is worth noting the differences in valuation between Barrick and Newmont Mining. They are the two largest publicly-traded gold producers both in terms of gold ounces produced and equity market capitalization. They both also have provided similar guidance frameworks, both for 2018 and for 2019-2022. Newmont trades at a higher valuation, both in terms of earnings and as a ratio of enterprise value to EBITDA. As of Sept 7, NEM was valued at 21.7 times the 2018 consensus estimate of $1.39 and 20.1 times the 2019 consensus. (Barrick, as noted above, was valued at 17.3 and 15.2 times respectively.) Newmont’s enterprise value-to- trailing 12 months EBITDA (using my definition of EBITDA) was also higher at 9.2 times versus 5.9 times for Barrick. Clearly, Barrick’s stock has a cheaper valuation than Newmont’s. This reflects the relative underperformance of Barrick’s stock vs. its peer group since the end of 2012 and Newmont’s outperformance. With its outsized impairment charges, sales of partial interests in many of its mines, the problems at Pascua-Lama (and Acacia), senior management turnover and most recently, the disappointing second quarter financial performance, Barrick is also a more complicated story, which undoubtedly has some impact on its lower valuation. Differences in forward guidance may also be a factor. Barrick’s guidance implies higher EBITDA despite fewer gold ounces sold (because its per ounce production costs are lower), but its guidance also anticipates meaningfully higher capital expenditures over the 2019 to 2022 horizon. By my estimates, Barrick’s base production levels would produce annual free cash flow of roughly $500 million per year, compared with about $750 million per year for Newmont. Yet, as Barrick has responded to its challenges – by focusing on its most productive mines, selling off non-core assets, paring its debt and restructuring (and decentralizing) its operations – it has been repositioning for improved performance, even if the price of gold remains low. With the strategic restructuring largely completely, Barrick’s performance now depends upon execution. 2018 second quarter results raised concerns that the company may fall short in that regard; but management has left its 2018 guidance unchanged. If the company can deliver in 2018, Wall Street will begin to look at Barrick differently. This entry was posted in ABX, Materials and tagged gold, gold mining stocks. Bookmark the permalink. One Response to "Barrick Gold: A More Speculative Bet on Gold"